The pressure is turning up on Republican Sen. Susan Collins, who is still undecided on Brett Kavanaugh's confirmation to the Supreme Court. More than 200 protesters gathered outside Collins' office in Portland, Maine, ahead of Friday's Senate Judiciary Committee vote. The protesters, mainly women, were there to urge Collins to vote no on Kavanaugh. "Women are powerful and we want to be heard," said Theresa Foley. She said watching Dr. Christine Blasey Ford testify about an alleged sexual assault at the hands of Kavanaugh moved her to tears, and inspired her to tell her husband about an assault she suffered decades ago. "Women have had enough," she said. Collins and fellow Sen. Lisa Murkowski of Alaska, two Republicans who have been willing to buck party leaders before, have not yet said whether they will vote to confirm Kavanaugh in the final Senate vote. With Republicans needing 50 votes to confirm Kavanaugh, Collins and Murkowski are said to be key votes. Inside Collins' office, women staging a sit-in talked about sexual assault and abusers while Collins' staff took notes. One woman was so emotional that she went out in the hallway and began sobbing. Demonstrators packed into the office took turns speaking to Collins' staffers about their concerns over Kavanaugh. "One of the main factors for Sen. Collins is her own historical legacy," said University of Southern Maine political science professor Ron Schmidt. 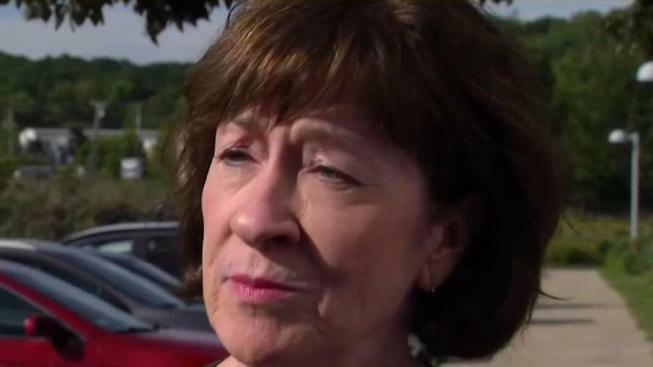 He said this may be the most political pressure she has ever faced, and while she may surprise him, he doesn't think Collins will stand in the way of Kavanaugh's confirmation. "I'm not familiar with a time where she has cast a vote that has cost the GOP something that other votes haven't already been cast upon," he said. "She has an opportunity. I'm not sure how she's going to use it." Outside, protester Theresa Foley fired up the crowd, speaking out against those who say women who were sexually assaulted years ago should have come forward then and not waited, referring to how Ford came forward decades later. "These poor young girls that are still fighting this stuff. Women have to push and pull and push women up, not take them down," Foley said. Some Mainers were so determined to reach Collins, they took a bus trip overnight to Washington and demanded a meeting with her. Organizer Diane Russell said a handful of them met with Collins and voiced their concerns. The Senate Judiciary Committee voted 11-10 Friday afternoon to report Kavanaugh's nomination favorably out of committee, moments after Republican Arizona Sen. Jeff Flake called for a one-week delay for the FBI to continue investigating sexual misconduct allegations against Kavanaugh. Collins tweeted Friday afternoon that she supported a "sensible agreement" to request the FBI conduct a supplemental investigation into "credible allegations" against Kavanaugh. Flake, who has been mentioned as a potential 2020 presidential candidate, is scheduled to give a speech on Monday night at Saint Anselm College in New Hampshire. Also on Monday, Flake and Ohio Gov. John Kasich are scheduled take part in a panel discussion at Emerson College in Boston. The school is seeking to cancel that event for "safety reasons."